What Are the Main Predators of Lobsters? Prior to adulthood, lobsters serve as a tasty snack for animals in the sea, on land or flying above. 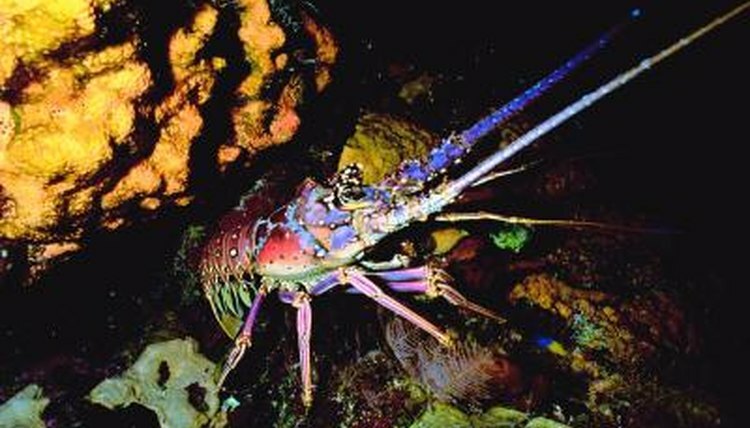 When they're fully grown, though, adult lobsters are mostly safe from other creatures except humans and their advanced trapping techniques. After the larval stage they spend years in hiding until they become adults, when they're most vulnerable only during molting -- even to other lobsters. Lobsters go through a larval stage and a post-larval stage after hatching. Lobster larvae live within 3 feet of the water's surface. Here they're easy targets for swooping sea gulls, passing fish and other aquatic organisms that roam the ocean's upper levels. After the lobster has completed its molting in the larval and post-larval stages, it begins looking for somewhere to settle on the ocean floor. Only about 10 percent of lobster eggs reach this juvenile stage of development. During the juvenile stage lobsters look like their adult forms, but they are still smaller and weaker than adults. At this stage they're vulnerable to lots of other ocean creatures. Cod are the lobster's primary enemy, followed by other fish that cruise the ocean floor for food. Tench, flounder, sculpin, wolffish, ocean pout, monkfish, eels, rock gunnels, dogfish and crabs are known to eat young lobsters when given the chance. Juvenile lobsters spend the first four years or so of their lives hiding in crevices or buried in tunnels to keep themselves protected from predators. It takes only a few minutes out of hiding for a young lobster to become a food source. Humans are the No. 1 predator for adult lobsters. With their hard exoskeletons and large pinchers, lobsters are well-adapted to protecting themselves against would-be predators in the sea. Occasionally seals will eat full-grown lobsters. Cod are the most likely of fish to chow down on these benthic crustaceans. Opportunistic raccoons have been known to raid lobster pounds, although they would never be able to catch such a delectable treat as a wild lobster. Lobsters in captivity will eat each other if left unchecked, but fully cannibalistic behavior has never been witnessed in the wild. Once they reach adulthood, lobsters are unlikely to be eaten unless they're molting. Lobsters molt up to 25 times in their first 5 years of life. When they reach adulthood, molting slows to once a year and later once every few years. When a lobster sheds a shell, it can take up to two weeks for the lobster's new shell to fully harden. Molting lobsters, if caught out of their hiding place, may get eaten by other animals that patrol the ocean floors. A lobster may even eat another lobster if it happens upon one in this vulnerable state. Surprisingly, a male lobster has never been observed interrupting the reproductive process by eating a shell-less female -- lobsters can mate only when the female has just molted. Madeline Masters works as a dog walker and professional writer. In the past she has worked as a fitness columnist, fundraising copywriter and news reporter. Masters won two Pennsylvania Newspaper Association Awards in 2009. She graduated from Elizabethtown College with a Bachelor of Arts in English. What Are the Largest Aquatic Mollusca? What Kind of Octopus Eats Sharks? What Animals Prey on Blue Crabs? What Is the Life Span of a King Crab?